Keep your outdoor patio and decorations sparkling clean in an environmentally friendly way with this Soft outdoor scouring pad by Goodbye Detergent. Made out of environmentally friendly walnut shells, which are naturally abrasive, the pad does not require detergents or soaps and can clean only with the use of water. This lack of detergents also helps the environment, as it reduces the use of toxic chemicals. 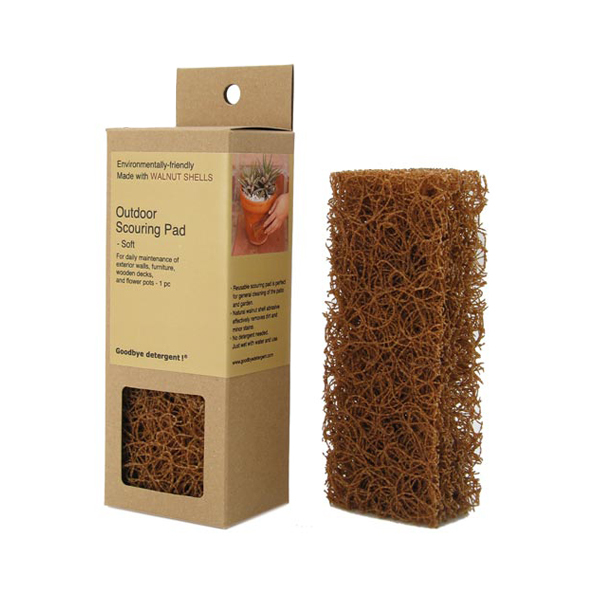 The sponge is ideal for outdoor furniture, decks, flower pot stains, and other outdoor decorations. Please note: Soft pad sold as 1 pc. Outdoor Scouring pad- Soft - Made with Walnut Shells and Non-woven Nylon. General cleaning, removing minor stains on exterior walls, furniture, wooden decks, and flower pots.